This book would not have come to life if it weren't for the thousands of Facebook and Instagram fans who have followed SoCal Pitbull TEAM and Buddy the Therapy Dog's pages through the years. Those of you who have encouraged us to put out a calendar or coffee tabel book with all of those images Barb has captured of Buddy & Vinny in ridiculous outfits, THIS is for YOU! 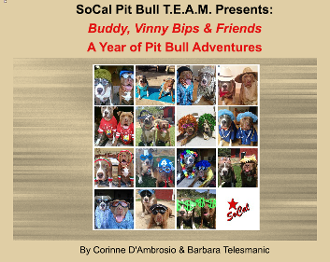 This beautiful full-color coffee table book is full of the BEST pics through the years, organized in a month-by-month format, to capture all of Buddy and Vinny Bip's best moments. With help from their Pitbull friends, these pups give a (hilarious) voice to a much misunderstood breed. Equally fun and informative, this book will be a favorite in any dog lover's home. SoCal Pitbull TEAM is a non-profit organization established in 2012 to encourage and promote Pitbull adoption to everyday people and families, foster responsible dog ownership, and aid in the welfare of Pitbull mixes and the people who care for them. Your donation entitles you to receive the eBook of the same title. A link and instructions to download to your iOS(Apple) device along with a PDF copy will be emailed to the address you have on file with Paypal. If you check oout as a guest, please be sure toinclude your email address for delivery. 100% of the proceeds from the sale of this book go to bully breed dogs in need! PRICE REDUCTION (only a few left)... Used to be $25!! !